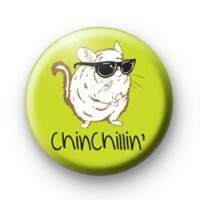 This fun Chinchillin badge is perfect for anyone that is totally relaxed, maybe a little too zen. So if you like to go through life chilled to the max then you need this badge in your life. If you need any other funny. humorous badges we do have a huge selection in the shop so make sure you take a look at those too.